A 30"x 40" oil painting on canvas. This is a landscape depicting an evening view from Garvin Mesa looking toward Mt. Lamborn. Building a log cabin amid the piñon-covered canyons and mesas of southern Colorado rekindled Rick Young’s passion for art. After earning a Bachelor of Fine Arts degree from Miami University (Ohio), Rick put painting on the back burner. He moved to Colorado to explore its mountains, canyons, and prairies and to pursue a career in teaching. A growing appreciation for the subtle beauty of the American Southwest led him to pick up a paintbrush again in 2000. Soon Rick developed his own unique approach to capturing the Western landscape in oils. While earning an MA in U.S. History at the University of Colorado at Denver, Rick researched the experience of one group native to the Southwest: the Southern Ute Indians. This work culminated in Rick’s award-winning book, The Ute Indians of Colorado in the Twentieth Century (University of Oklahoma Press, 1997). Since resuming painting, Rick has tapped his knowledge of the diverse peoples of the Southwest—Native, Hispano, and Anglo—to better depict the human imprint on this land. A strong theme in his work is this human element as a part of the landscape. Rick’s paintings celebrate the quiet beauty of the rural Southwest, captured in painterly fashion. Most striking is Rick’s dynamic use of color. The artist scrapes beneath the dusty surface of the Southwest to draw forth unexpectedly vibrant color. 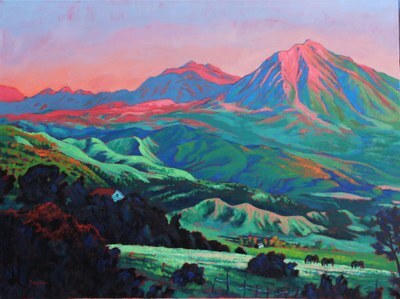 Rick’s work has garnered numerous awards at the Front Range Art Exhibit, the Santa Fe Trail International Art Show (Trinidad, CO), and the Romancing the Arts show (Castle Rock, CO), where his paintings won Best of Show in 2008, 2010 and 2012. Rick’s paintings are exhibited at the Art Exchange Gallery in Santa Fe. Digital images of his work can be seen at www.RickYoungFineArt.com. In addition to pursuing his own artwork, Rick teaches art, history, and world religions at Daniel C. Oakes High School in Castle Rock, CO.